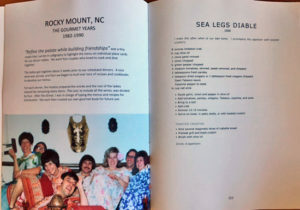 Recently a friend shared with me cookbook memoir written by a friend of hers. As I looked through the pages of recipes, stories, and family photos, I knew this type of memoir would be a great fit for some of my readers, even some of us who don’t consider ourselves “cooks”. Many of us have memories that are either centered on or connected to the meals we ate as a family or the special treats we enjoyed on special occasions. I will be expanding this topic further, but for now, I wanted to start with a few tips on how to write a cookbook memoir. In a cookbook memoir, you can share stories about your food traditions and favorite eats, while also passing on family recipes. In some cases, you can even share significant life events that had any kind of food connection. If you’ve been hesitant to write a memoir because you are uncomfortable having all the attention on you, this is a terrific way to share some of your life stories without the putting yourself on center stage. Our first rule at MemoirHelper.com is that you can’t do it wrong unless you don’t get it done… So let’s get started! Start by listing your favorite childhood homecooked meals. Add your favorite childhood homemade treats. If there were any recipes that you helped prepare as a child, add those to the list. Add any recipes that you have made for others that became their favorites. Do you have favorite recipes that you cook for yourself? You know the drill… add them to the list! Lastly, add any foods that you love or have loved as an adult that someone else prepared for you. Describe any food traditions that have been a part of your life. Write about the setting, the emotions, and any particular experiences associated with the foods you listed in the above steps. Find the recipes you want to include. You may need to dig through your index cards, old cookbooks, or even contact family members. Gather photos that might be associated with any of the meals, treats, traditions, or people you’ve included in your list of foods. For each recipe or group of recipes, write an introduction explaining why you’ve included it. Organize your recipes into an order that makes sense to you. It may be by type of food, by tradition, or by meal. Write an introduction to each section you have created. That’s pretty much all the heavy lifting for writing a cookbook memoir. How you put it together depends upon your desired goal and resources. Here at MemoirHelper.com, we would be happy to discuss your project and help you get it done! We think you could even use a tool like MemoirWorkbook.com to put it all together and will be creating a video soon to show you how. Let us know your thoughts on writing a cookbook memoir in the Comments below!